Preheat oven to 350º F. Sift the dry ingredients to each other. Add the sugar and honey to the butter and cream until fluffy. Add the egg. In a small bowl, combine the milk and the vanilla and stir. Add a fourth of the flour mix to the butter mix, and mix it in. Add a fourth of the milk mix, and mix it in. Continue to alternate like this until both mixes are mixed into the butter mix uniformly. 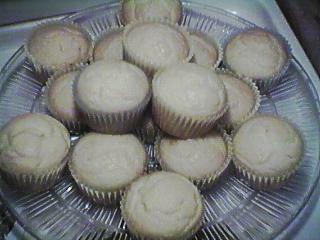 Pour into cupcake tins and bake 15 to 20 minutes. Cool for 10 minutes in the pans, then cool on a rack.